LOS ANGELES: After the referee raised Filipino World Boxing Association Manny Pacquiao's hand in victory over Adrien Broner to keep the 47-pound belt tucked in his waist, the boxing world's attention turned to the projected rematch between him and Floyd Mayweather Jr. The first time, however, it took more than five years to get it realized. When it did, Pacquiao injured his right shoulder that required surgery. Mayweather took a wide unanimous decision in a fight that to many was a farce. And after that 2015 defeat, Pacquiaot thirsts for a rematch not alone for financial reasons but because fans want it. After that meeting in Tokyo, the two bumped at each other at the Filipino Heritage NBA game of the Los Angele Clippers at the Staples Center. “That (Staple Center meeting) was coincidental. But in Japan, he came to my table and said he wanted to fight me,” the Filipino lawmaker-fighter reminisced. 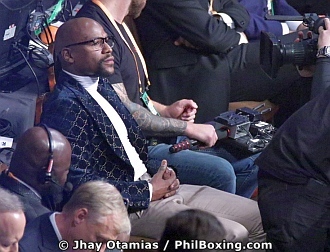 Mayweather was at the ringside watching the fight but left without attending the post-fight news conference. He remains non-committal though after virtually hurling his challenge to Pacquiao. Mayweather Promotions CEO Leonard Ellerbe on the same day contrasted Pacquiao’s recollection. Pacquiao’s training consultant Freddie Roach, in a separate interview, said he thought Pacquiao had done enough to get a rematch with Mayweather, but added that from his experience during the long negotiations for the first that this doesn’t mean a thing.